New Delhi : A Maharashtra-based senior IIS officer Prashant Pathrabe has been given additional charge as Director of Film and Television Institute of India (FTII), which has been rocked by a students agitation over appointment of Gajendra Chauhan as chairman. 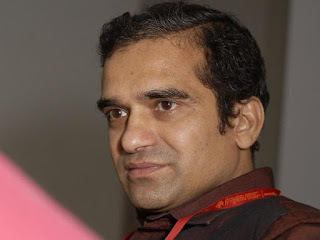 Prashant Pathrabe, a 1992 batch officer of Indian Information Service (IIS), has been given temporary charge as Director of the FTII by the Information and Broadcasting Ministry as the term of the incumbent, D J Narain, is ending this week, a senior official said. Pathrabe said that he received the Ministry's order on Friday. Asked about the students' agitation in FTII, he said he will talk about it only after taking charge but added that it was a "difficult situation" and he hoped to do his best. Pathrabe is the Director of PIB unit in Pune, where he will continue to work, officials said. "He (Pathrabe) has been given additional charge as Director of the Institute as the tenure of Narain was ending," a senior official said in Delhi. Pathrabe is also a former director of the National Film Archive of India (NFAI). He had been in the media field for nearly two decades, having worked in Doordarshan News and AIR News in Mumbai. He did his MBA from IIM, Ahmedabad and joined the Indian Information Service after a couple of short stints in the private sector. His appointment as Director of FTII comes at a time when the institute is at the centre of a major controversy with students boycotting classes after government announced its decision to appoint Chauhan as the head of its governing council. The FTII administration too has taken a tough stand, asking students to resume academic activities or else face action including possible rustication. The students' strike against Chauhan's appointment on Friday entered its 36th day.